Anti-wrinkle injections vs dermal fillers, what do I need? 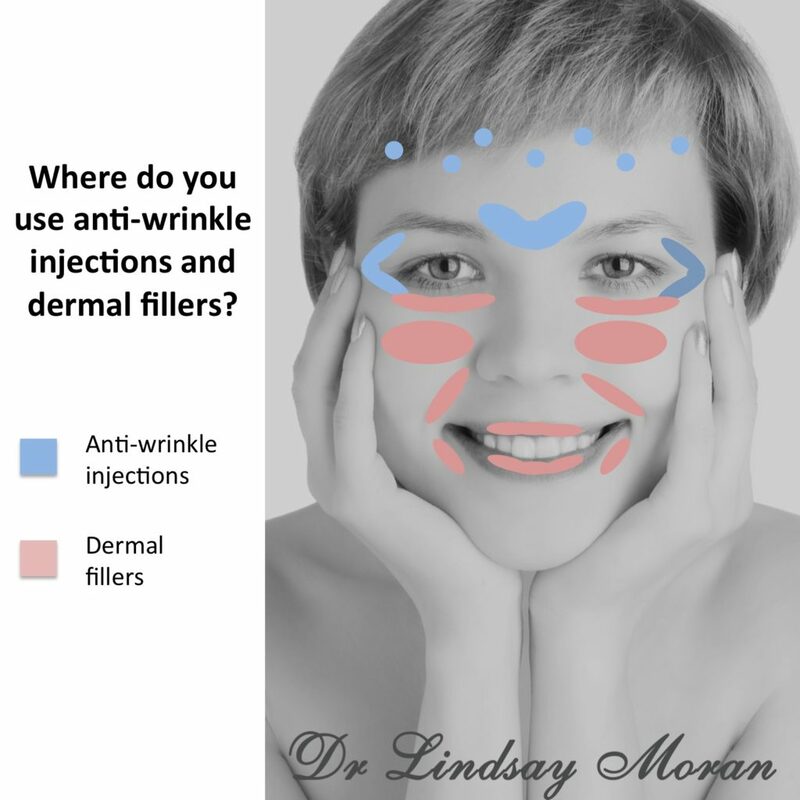 One of the frequent questions that my patients ask me are whether they need anti-wrinkle injections or dermal fillers. It can be confusing, especially for people who are new to the industry, and actually a combination of the two can give a really lovely effect. So here’s the low down. Most people when they start tend to start with anti-wrinkle injections. These injections relax the muscles and stop them contracting as strongly for a few months, meaning that the skin overlying the muscles no longer gets bunched up and lined by regular movements. The result….. wrinkles appear softer and can even disappear. Anti-wrinkle injections are mainly used in the frown lines, the forehead and around the eyes, although they can be used in a lot more places. (Have a read of my blog here for more information on where you can use anti-wrinkle injections). Dermal fillers on the other hand replace volume loss. As we age we lose a lot of volume in the face, sadly! Our collagen fibers become less effective, we lose areas of fat on the face that give that youthful plumped look, ligaments holding our muscles start to sag and we even lose a certain amount of our bone structure leading to more angular features. This is where dermal fillers come in. They are made up of a solution of hyaluronic acid that naturally occurs in the skin and is great at giving volume. Generally speaking, anywhere on the face where you see volume loss, you can use dermal fillers to replace it. Mostly I use them in the cheeks, in the tear troughs (under the eyes), around the mouth and in the lips. They can also be used to reshape the jaw, smooth over the temples, give a brow lift and fill out static wrinkles. Quite often I will use a combination of anti-wrinkle injections and dermal fillers in my patients. It wouldn’t be unusual for someone to start having antiwrinkle injections, then after a few years when volume loss starts to occur, I also treat them with dermal fillers. The two treatments complement each other quite nicely.